Adobe with all its big,complicated and expensive products including photoshop are all for the professional graphic designers and photographers. Even the so called user friendly "elements" version is all not for everyone to handle it needs some professional expertise. To put an end to this the company has introduced a concept for what is calls " Intelligent digital assistant photo editing". This latest tehnology includes the technology and intelligence. According to adobe their speech recognition system can directly accept natural user voice istructions for image editing. You can give them either locally through on-device computing, or through a cloud-based Natural Language understanding service. The 30-second clip published by Adobe shows a man using what appears to be a modified version of Photoshop Express on an iPad. The app features a microphone button on the top which allows the user to initiate the digital assistant.In the demo, the user asked Adobe’s digital assistant, which sounds like Siri or Alexa, to crop a photo into a square, flip the photo and flip it back again.Assuming it actually worked with a degree of accuracy, a voice-powered photo editor could be huge boon to elderly users, many of whom only have a phone or tablet as their connection to the web. 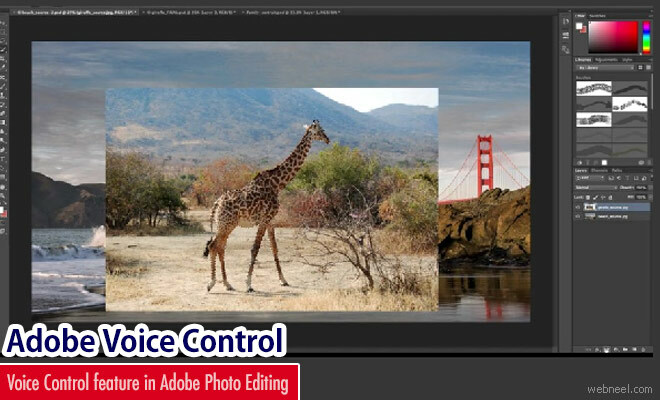 Adobe introduced Voice controlled Feature in Photo Editor Neel Adobe with all its big,complicated and expensive products including photoshop are all for the professional graphic designers and photographers. Even the so called user friendly "elements"